(From Konica Minolta lens literature) This ultra standard 4.3X zoom lens covers a range from 24mm wide angle to 105mm telephoto. Its widened focusing ring will not rotate while in AF. The lens features a circular aperture and aspherical lenses for clear and vivid images, as well as, beautiful defocusing effects. Small and durable build, seems to be plenty sharp when stopped down a bit, bokeh, no zoom creep, zoom and focus rings nice and tight, but relatively dampened well. Not as sharp as I hoped when wide open. Some of the previous reviews claim the build quality is not good. I beg to differ. The build of this lens is excellent. Sure, the external body is made of polycarbonate, but it is durable enough and the inside of the lens obviously has plenty of metal (and glass) due to its weight. Optical quality is also decent, but not "G" class. On my A700 & Maxxum 5D I have gotten some great pictures. Vignetting isn't really an issue with an APS-C sensor. I can't say for a full frame camera. The zoom ring has no creep and it feels good. The focus ring is a bit stiff, but it does have a clutch mechanism to prevent it from rotating when in AF mode. This accounts for the added stiffness. I would definitely recommend this lens or its new Sony variant if you are looking for a decent range on APS-C or Full Frame cameras. I use this lense on a 24 meg A900, which demands high quality glass. The lense seems to do well between f/8 and f/16. It is disappointing when you go to f/22, as the edges begin to show visible softness. Still, I really like this lens and rely on it for much of my wideangle work. I think most folks would be pleased with its' performance and the overall quality of the construction. This lens is small and light weight, making it very easy to use as a fairly versital lens when you need to travel light. Once you step down the lens a bit (aperture set to a fairly useful size of f/8 or f/11), the image is quite good. wide range, very light, sharp, reasonable price. vignetting at 24mm (film), distortion, corners softness in wide angle, under average construction. I got this lens together with a Minolta Dynax 7 (or Maxxum 7), film 35mm. 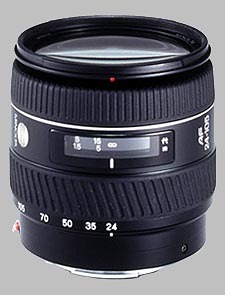 This lens provides a rather wide and very useful range, at least for 35mm film: 24mm is wide enough for most landscape applications, and 105mm is reasonable telephoto. I often used this lens as my only lens and found it great for travel, hiking and trekking. However, I would not like this range much if I had a 1.5x crop camera, since I would lose wide angle and not get real telephoto, so that I would probably need to carry more lenses for the same application (at least one wide angle), so that it would not be so useful as a landscape kit. This lens is very light and very convenient to bring, since it is also quite small. The price is quite reasonable for what you get too (so that one should not be too concerned about using it for travel). Overall, it was the perfect match for the Maxxum 7. Regarding to optical quality, I found the lens quite sharp, especially in the middle and in the long part of the range. In the wide angle area, it is sharp enough for producing good slides provided it is stopped down to f/8. As one could expect, the performance is lower around 24mm, especially in the corners, which is a bit frustrating sometimes. I have had no chromatic aberration issues with it so far. Vignetting can be a problem between 24 and 28mm, especially when using filters (like circular polarizers); I would recommend buying a slim filter. Distortion is also not very well controlled below 28mm. My overall opinion about image quality is that it is mostly decent, but never great. The 24-28mm range (which one might be very tempted to use quite often, especially for landscape) is the most difficult to use: not only one needs to stop down, but one must also beware with filters. The construction quality is only average. The lens is made of good quality plastic, but it extends quite significantly while zooming and is a bit wobbling when fully extended. I would be a bit concerned about the way the pieces are adjusted and remain so over the life of the lens. To conclude, this lens is very useful for travelling light, with a significant range covered in one single lens.